Francis Williams, born around 1702, was apparently the youngest of the three sons of John and Dorothy Williams, free Blacks, who, in 1708, with their sons, were granted by the House of Assembly the privilege of not being subject to slave evidence in court, a status reserved for Whites. 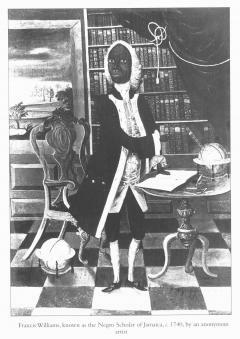 About 1716, the Duke of Montague, then Governor of the Island, proposed an experiment to solve the problem, much discussed in Jamaica and elsewhere, as to whether a Black man could equal a White man if given the same education and opportunity. He chose Francis Williams because of the promise he showed, and sent him to England, where he studied at first at a grammar school, and afterwards entered the University of Cambridge, where he made considerable progress in mathematics and other branches of science. He also excelled in the study of the classics, an essential part of the education of an 18th century gentleman. As a result he wrote a considerable quantity of Latin poetry in the accepted style of the period and often addressed to Governors of Jamaica. Having spent several more years in England, Williams returned to Jamaica, where the Duke of Montague offered to give him a place on the Council which advised the Governor, but this offer did not materialise. Under the Governor's patronage he opened a school in Spanish Town, the capital of Jamaica. He taught reading, writing, Latin, and the elements of mathematics, but there is no clear indication of who his pupils were. He trained one of them who was Black to take over the school, so clearly he had Black pupils. Possibly Coloured and even poorer White citizens of the capital may have ignored Williams' colour and sent their boys to be taught by a Cambridge educated scholar. It seems that Williams died around 1770. Unfortunately the teacher he had trained to continue to run his school suffered some form of mental break-down and there is no record of the fate of the school; it was in fact fairly common in the 18th and 19th century West Indies, as elsewhere, for schools to disappear with the death of the individuals who had started them. Edward Long, whose 'History of Jamaica'is one of the main sources of information on Williams, was not at all flattering about Williams character and behaviour. He described him as 'haughty and opinionated'; accused him of looking down on his fellow Blacks, even his parents, and treating his children and his slaves very harshly. Long suggested that he adopted an exaggerated style of dress, including a very large wig, a ruffled shirt and a sword, in order to secure great deference from those around him, especially the Blacks. Some of these characteristics were undoubtedly copied from the Whites who dominated the society, and seem understandable in one who must constantly have had to assert his position in a society which had not previously had to accommodate an educated Black man. 'The bountiful Deity, with a hand powerful and firm, has given the same soul to men of all races, nothing standing in His way.